Luke, this is your mother. "Do not underestimate the power of the... What are you laughing at.... Ha ha ha. Very funny, now who did this." This is when Darth Vader was trying to hide from the Jedi. Dressing up like one of the locals. Homosexuallity has struck even deathstar.. I can feel your anger. I am defenseless. Take your weapon. Strike me down with all of your hatred and your journey towards the dark side will be complete! 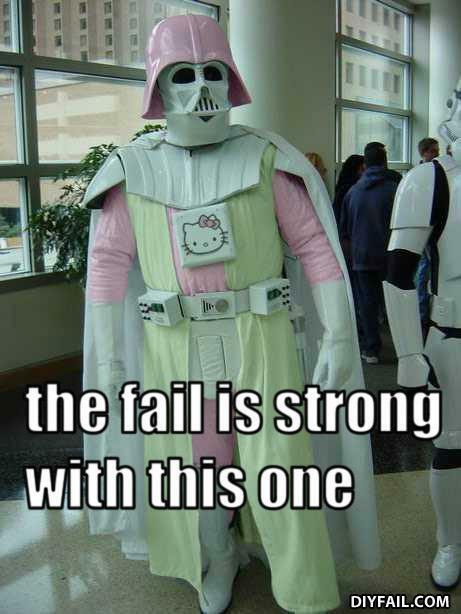 darth vader: Hello kitty is cool now. Geeks. Luke. You were right. You were right about me. Tell your sister... you were right. Darth, is that you? You look FABULOUS!! This is the forces most epic win!!!! People!! This is a WIN!